Be sure to check in and see if you were one of this week’s release winners October Release Winners Page! Our new look book is such a great way to enjoy each release and to get a good look at all of the sophisticated and trendy designs that Papertrey Ink has to offer. Don’t forget, you can click project images to visit blog posts. The look book will be updated after the release with links to shop the products as well. You have until 9:30pm ET today, October 15th to post a comment and be eligible to win. Only one comment per person please. 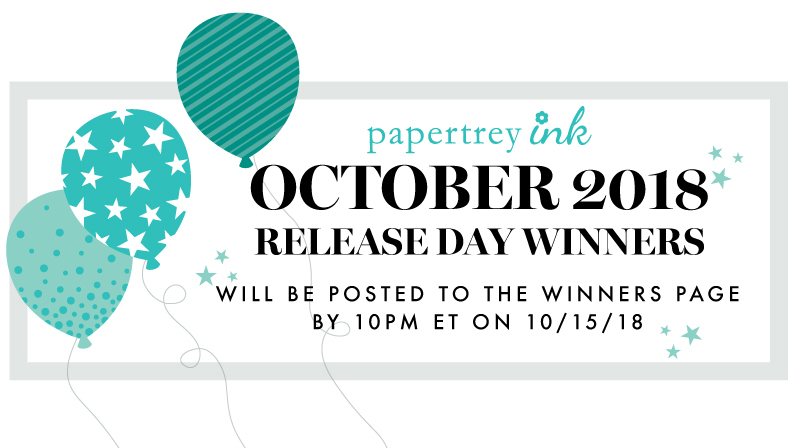 One randomly selected winner will be announced on our October Release Winners Page by 10pm ET, today, October 15th. Thanks for joining in our release festivities today and best of luck with the contest! I love penguins. They r so playful and cute! My favorite has to be the penguin. Gotta be the PA black bear. While I don’t want one in my living room, they can be fun to watch. It always amazes me how small their eyes are. Other than my girlie girl, Decker Do? A polar bear! (teddy bears in summer, polar bears in winter) White, always walking on ice, playful in the snow and water! Polar bear…..we have a darling one at our local zoo. Well, I associate cats with every season, since I have two of them–and a kitty purring on my lap is a very cozy way to spend a winter evening–but when I think of winter, I guess I think of reindeer and penguins and polar bears. I love the penguin treat holders this month! And a lot more too! I associate deer with the winter season, even though we don’t have them here in Australia. They always look lovely in a winter scene on a card. I would have to say the black capped chickadees in our pine trees. Love to watch them visiting our feeders. Interesting question… I live on a small farm out in the country. During the winter months we often see deer wandering around our property looking for food. They are seldom seem in the warmer months so I would say that I think of deer during the winter. Deer-we have a few that winter in our neighborhood. It is great to see them against freshly fallen snow. They are beautiful animals. I love seeing cardinals—that bright pop of color against white snow is so beautiful! I love reindeer during this season! Great release….now have to make some hard decisions! Asking for a favorite animal attached to the season is like asking who my favorite kid is. And the answer is the same…it depends on the minute you ask me. I think reindeer, but then penguins are super cute and fun to create with, and who doesn’t like a beautiful polar bear?? So many wonderful ones to choose from, I’m not sure I could ever truly have a favorite. Reindeer! And of course the jolly guy comes with them. All animals take on a wintry look for the holidays, but those deer are a symbol of the season. Loved every bit of the new release! So much to love, too! And you all did such a great job with showing us possibilities. The animal I associate with the holidays is the reindeer…Santa’s transportation! But my favorite animal to use in holiday paper crafting is the penguin. Chickadees are my winter favorite! Have a great big feeder outside my window so I can watch them everyday! My favorite are penguins, I love how fun and playful they are and super easy to co,or too lol. Gotta be reindeer! I loved leaving out carrots for Rudolph along with cookies for Santa, something carried through with our kids. Holiday traditions are the best! Favorite animal associated with Christmas would have to be a reindeer – although polar bear could tie!!! Polar bears are definitely the animal I associate with winter! Although the deer can be a problem in our yard–eating hostas and other plantings, they are the first animal I associate with the winter season. I am going to list deer, since I have watched Rudolph the Reindeer many times as a child. Reindeer (especially the one with the bright red nose) to guide Santa’s sleigh. I also love rabbits, owls, and bears. Well, the reindeer, of course! How else would Santa get here? Definitely a reindeer! They are very holiday for me! I don’t care for them in my garden, but they are awfully cute on a card! I think of deer and cute little white snowshoe bunnies! The animal that I associate with the winter season especially Christmas is Rudolf the Red Nose Reindeer . I just keep thinking about that red nose of his that was used to guide Santa’s Sleigh! I would have to say polar bears and penguins! The first thing that popped into my head was deer. I love to see them on winter/Christmas cards. I also associate cardinals with Christmas – their vibrant red is so beautiful on a Christmas card. Deer are my favorite animal that I associate with the winter season. So peaceful! I suppose deer…but not in the summer when they eat my roses and hosta! Reindeer. We have a fallow deer farm in our community, and they look like miniature reindeer. So many memories of these beautiful animals. Deer/reindeer. They always seem to unexpectedly make it into my projects. I am going to have to go with a tie between a big beautiful bear and a graceful deer! I shall include birds among the animal choices so that I can make the snow hunting as my favorite creature associated with winter. I met this little fellow in the color pages of The Burgess Bird Book for Children, given to me by my father, an animal lover, when I was 10. The snow bunting is described by the author as “the one small bird that is largely white”, and I have admired the toasted-marshmallow color of his handsome breast ever since. Penguins on ice at the zoo here in Australia! I love cardinals & nuthatches in the winter. Winter animals … hmmm. Polar bears, fox, penguins, owls. All fun animals for crafting, but I think I’ll try my hand at making an arctic fox with Heather’s Winter Fox set!. Although we have deer in our yard year round, I think of them especially at Christmas. Deer is the animal I associate with most during winter. Interestingly enough, I don’t see them often enough, but I love the ermine or winter weasel. They are super adorable. I have never seen a stamp of one though. Underrated animal. I live in NM and so my “Winter” animals here are very different from the ones of my childhood in the Midwest. Here we have Sand Cranes that take up residence in the 3 acre common area of our development. They arrive in the late fall and fly away in the spring-they are so beautiful and I look forward to them every year. I would have to say a Cardinal is the animal I associate most with winter. We have a large blue spruce tree in our yard that the birds like to nest in and a feeder they like to gather around. They are so pretty against the winter snow. I love reindeer walking on the winter snow. Beautiful red Cardinals. I actually have 3 favorite animala associated with the holiday season. My top 3 are deer, polar bears, and penguins. I love animals so that’s probably why I have so many, lol, but during the holiday season I find I love to color these three animals the most. If I’m not coloring them then I’m trying to find dies or wooden pieces of them to add to my projects. By the way I am loving the look book! Such a magnificent idea as it’s so helpful! Well, they are not animals but I associate red cardinals and doves with Christmas. My favorite animal…the one I associate the most with the winter…is the cat…strays and ferals tend to show up at my back door cold, hungry, and sometimes pregnant. Cardinals and blue jays because they add a happy brightness to the long winter! Yes, what Sandy said! Lol! Cardinals and deer, probably because I see them in my neighborhood. Reindeer! Loving the new reindeer gift card/treat holder! Probably polar bears. I remember those adorabkle Coke commercials. Wish they’d bring us more of those commercials. They were well done. I would have to say Reindeer are the animals I associate most with the holiday season! One of our local Santa spots has reindeers that stay with Santa while he visits with the kids, so cool to see them! My favorite animal would be any in the deer family . . . elk, reindeer, etc. I love their beauty and watching them as they move through our back yard, munching on the fallen apples. Reindeer for me! But I do love me some penguins sliding down icebergs too. I must enter the Graceful Doe with fawn. They are gorgeous against a snowy white background or peeking through a group of trees. My favorite is the Robin Redbreast, a very popular image on Christmas cards in England . These always take me back to my childhood in London, when I would help my mum with the Christmas cards, some with such strange addresses as, “The newspaper lady at Shepherd’s Bush Station” – and the lady rec’d the card each year! I always think of cardinals. We have lots of them in our yard and the contrast of the deep red feathers against snow is always delightful! I think of bird in winter – specifically the beautiful cardinals and the saucy blue jays – you can sometimes spot them in the other months but winter is when they make the most appearances and you just have to stop and watch them. Cardinals against a snowy background is my animal/bird association with winter. Living in So Cal it only snows in the mountains so I enjoy using cardinal stamps on my Christmas cards. A deer. I love the gentle beauty they have. A touch of color in the white snow. So many gorgeous cards are done using them too! A polar bear as I love to cuddle up in my blankets and sweaters. Penguins are my favorite in general. Penguins because they are so cute. Love lots of winter animals but the reindeers always remind me of serenity and calmness. Just love the polar bears. Deer are the animal I most associate with winter, but I especially love watching all the birds at the feeder. I love the bright, red cardinals in our snow covered pines! The playful antics of penguins always make me smile, too! Reindeer! Rudolph comes to mind. I especially adore the free set, stamps and dies. So sweet with doeful eyes. The samples give great color ideas! I meant deer set, not free set! Of course, the first animal that came to mind is a reindeer! Beautiful and strong. Great question! My answer is all of the lovely birds of winter to brighten up a sometimes dreary day. Cardinals, blue jays and more but my very favorite are those sweet little chickadees! My grandchildren and I love watching them at the bird feeders and sometimes their antics as they all want to eat at the same spot! Penguins are a holiday and winter favorite of mine for the holidays and winter season! I most associate deer & reindeer with the holidays – They’re so beautiful! So many cute sets again this release! Gosh, it’s hard to pick ONE animal! I would say penguins! The new set is super cute!! I love polar bears. They are beautiful, graceful and so much fun to watch. Never thought about it before, but I probably associate deer and penguins most with winter. Living in rural Midwest, I really love seeing the Fox . They are nocturnal but appear more in the day time during the winter looking for food. When seen with little ones is rare, but oh so beautiful. The first animal that comes to my mind is the deer. We see them occasionally in our back yard feeding. My son has had a stuffed polar bear since he was a baby and he takes it wherever he goes, so that has become my favorite winter animal because I associate it with him! I can hardly decide. Maybe a reindeer because they pull Santa’s sleigh. But I also love funny little penguins. My favorite animal has been the polar bear featured in the Coca-Cola commercials around the holidays! My favorite animal associated with the winter season is deer. Love them on cards in a wintery scene. Winter always makes me think of snow, and my favorite animal is the Polar Bear. Favorite would be deer–not with Santa, though. I like polar bears, too. Wonderful release! Reindeer! They bring the sleigh of goodies and make magic for children everywhere! I think of the deer roaming our property. My favorite animal for the holidays is regular Deer, the kind I see roaming thru my yard. I like to create a scene on my mantle with a few white deer figurines, white trees and white lights. Very serene yet festive. My favorite animal is a deer. They stNd so proud and stately. And those eyes. Beautiful! This may sound funny, but it’s squirrels… We had a couple in our back yard that used to run around and hide the walnuts we left out for them in the snow… when the snow melted in the spring, we’d find walnuts all over the yard! I would have to say deer are the winter animals I think of most often. The bucks with their majestic rack of antlers are pretty awe inspiring. My favorite winter animal would be deer. Great October release! I enjoy watching the winter birds, especially the cardinals. I always associate deer with winter—they are so elegant and majestic! What a wonderful release! This is just a wonderful release this month. The Potbellies are my favorites but there is so much great stuff from which to choose! My favorite winter animal would be a reindeer – they are essential to Santa’s mission on Christmas Eve – aren’t they?? Beautiful projects highlighting these awesome products!! I most associate reindeer with the holidays! Reindeer, polar bears and penguins, oh my! LOL! Love them all, but if I had to pick a favorite, it would probably be penguins. Great release! Amazing variety of products. My favorite….that’s a hard one. The red of a cardinal against a snowy branch or the amazing Polar Bear for his strength and endurance of a cold winter. The warm feeling you get when Deer are feeding in a meadow or the giggles you get as you watch a Penguin waddle across the ice. Ah…..winter. I always think of red cardinals when I think of winter. The beautiful red against the white of the snow. Well, the reindeer, of course! How else could Santa Claus bring those wonderful presents to all the good little boys and girls! I always think of deer in wonderful winter scenes for the Holidays. The first animal that comes to my mind are deer. They are so beautiful and graceful looking. And they do look great on a card. But another picture just popped into my head: the manger scene, with sheep surrounding the baby Jesus and the cattle lowing. I guess I’d have to include those in my favorites too. I love deer in the winter time. Love seeing them frolic in the snow. I think my favorite winter animal is the reindeer. They’re big eyes They are Majestic and magical. And I think that stems from my favorite book to read to my daughter on Christmas eve her birthday is Reindeer Moon. I love the little deer as it immediately made me think of a wintery scene with the little deer. Kind of like young Rudolph! And those doe eyes! Penguins are definitely my favorite winter animal. They are so adorable! I love the reindeer. It’s always of sign the holidays are coming! Reindeer of course. Santa won’t arrive without them. But then I also love polar bears and penguins, too. Great new release! Snowbirds! When they get really active, I know that snow is on the way! Though I know they’re year round, I always think of deer as a holiday animal. I guess we have to thank Santa for that. The polar bear is my favorite winter animal. The first winter animal that came to mind is the beautiful red Fox. (Maybe because I live in Florida). Thanks to everyone for an outstanding release! Being an animal/bird lover, this is a hard question to choose just one so here are a few of my favorites. Santa’s reindeer (white tailed deer) are a 12 month resident and it is always great to see them in the morning and evening. Cardinals are also a year round resident but you can’t beat the male’s Christmas plumage. Then there is the Dove – the universal symbol of peace. My favorite winter animal is probably the polar bear, with the reindeer as a close second. Wonderful release. Thank you for another fabulous release. Love the pot bellies 🙂 See you tonight for the release. Polar bears and penguins! Not because I’ve seen them, but they just make me think of ice and cold. Your penguins are adorable. Another great release! Polar bears remind me of winter with the white color and snow. But reindeer, hands down, are the holiday animal I think of most. You can’t help but think of the reindeer pulling Santa’s sleigh or the shiny metallic reindeer on a mantle with candles. I always associate polar bears with Christmas. I really like any kind of bear though. I’m such an animal lover, so it’s hard to pick just one….but I do love the reindeer at Xmas. Deer have to be my favorite as they are so elegant and graceful. Polar bears would be a close second with their cute-ness! Your release has been absolutely fabulous. I think deer are my favorite animal of winter, especially reindeer! The Arctic fox…snowy white, resourceful and very cute! The fur makes me think of staying cozy during a blizzard. Reindeer of course! Santa can’t pull his sleigh without them! I really love a Christmas mouse. Those penguins and reindeer are awful cute too! I think a little fawn might be my favorite animal for winter . Another beautiful and fun release! The design team outdid themselves once again!! Favorite winter animal: My childhood memories of winter were of the bright red cardinals in the huge pine trees covered with snow in our backyard. A penguin. It was always my childhood favorite. And even now when I visit our zoo with my teenage girls it is sooo cold inside of their exhibit that it feels like winter. Because of Rudolph & Bambi I would have to say reindeer/deer. That’s why Fawn & Flora is at the top of my list! Reindeer! It’s got to be reindeer when I think of Santa and holidays. Thanks for asking and for a chance to win this incredible prize. Hard to decide what my favourite winter animal is. I choose a robin! It has been a wonderful release, and I can’t wait until tonight to purchase the new products! Penguins and polar bears are the first wintry animals I think of, but cardinals and deer also come to mind. reindeer…without these beautiful creatures Santa would not be able to deliver all his wonderful gifts. plus, they are just magical! I’ve never thought about it, but I’d have to say Cardinals. The first thing that comes to my mind when you say “animal” and “winter” is a bright red cardinal sitting in a pine tree, with a snowy landscape all around him. My favorite animal that I associate with the winter season is the reindeer. They help Santa do his magic!! Great release this month! Thank you to the Design Team. So many from which to choose but I guess it would be the deer who come around looking for food in the winter. 🙂 Dogs…..I love dogs all year around. When dogs play in the snow, there is something magical about the way they bound from one place to another. It makes me smile every single time. Such a great release!! My favorite winter animal is a Penguin. The animal I associate with winter would have to be the penguin. My first thought was of the Holiday Folk Set with the deer, cardinal, polar bear, and penguin. It’s the sweetest set and includes all my winter favorites! I love to see deer! I love reindeer. Not only do they invoke images of Santa, but they also invoke images of beautiful Winter nature scenes. Definitely deer. I like to feature them on my Christmas cards. I enjoy watching deer as they are such graceful creatures. Penguins are my fav but that’s year round. Not the cartoony kind but images of real penguins. Polar bears a close second but NOT together please!- the live on opposite ends of the earth. The animal that I associate with Winter is a reindeer, a part of the scene flying over roof tops pulling Santa and Santa’s sleigh. Next would be deer, usually three, one with antlers, in snowy clearing among pine trees. Definitely the cardinal. It’s our state bird and they are beautiful on a backdrop of white snow. Reindeer. They’re such majestic looking creatures, and I think of them in the snow, and winter and snow just go together. My first thought was of penguins in the ice and snow. Those little cute ones, Adele penguins? Also, the ones that spend the entire winter huddled in a mass to survive (emperors?). Polar bears too. Of course, REINDEER!! They are such beautiful, stately animals and besides they help SANTA deliver all the presents to good girls and boys!! It’s definitely a deer I associate winter with, while penguins are a good runner up. My favorite holiday animal has to be a reindeer! This was a wonderful release—so many great products!! Polar bears – especially those cute little fluffy white cubs! I always think of cardinals. Every fall when most of the other birds fly south, several pairs of cardinals stay around our yard. It gives us such pleasure to spot them on the bare branches, so bright against the snow. Their red colouring seems synonymous with the holiday season! I think of penguin and polar bears! A cardinal! A beautiful red bird against a backdrop of the white snow is simply beautiful to me. I love Christmas cards that have cardinals pictured in snowy wooded scenes! Definitely Reindeers! Love the wonderful colors and outfits they can be dressed in! Love the bear for sure. There are so many, but I think my favorite is the traditional reindeer. They can be majestic or cute and fun like Rudolph. I’m not sure why, but I think of the fox. Maybe the silve Fox more so in the winter than the typical red fox. The reindeer of course! How would Santa get to all the homes without them. I like polar bears, but since I will probably never see a real one, I will go with a deer! I would say Reindeer. But sheep in the stable with Jesus would also be a great association! First thing I think of is the bright red cardinal, visiting our bird feeder all winter! I love the bright red against the white snow! I too like penguins and they are so cute on cards. I associate black capped chickadees with winter. I love to watch them come and go on my feeders! I love polar bears. I have a stuffed one with a hat and scarf that is so cute. Oh my! soooooo many favorites……Cardinals, Deer, Penguins etc. Guess I can’t choose just one! Has to be the reindeer! Polar bears b/c they are snowy white and that is what I associate with winter. I love to see deer in the winter season—or any time of year. They’re such beautiful animals! I guess it’s the red robin for me, probably come from all these Christmas cards I saw when I was a kid! I lived most of my life in England, and the creature I associate most with winter is the English robin. Smaller and more distinctly coloured than his American counterpart, winter scenes wouldn’t be the same without him. My favorite is deer in the snow, so serene and peaceful. Living in rural Oregon we have deer year round. I don’t enjoy their foraging on good plants but I do think of them at Christmas. Ya know, reindeer! the second would be a duck, again Go Ducks!! I would have to pick the deer for my favorite winter animal. Too bad we don’t have any in our area. My favorite is the Red Cardinal birds. So pretty sitting in the white frosty trees. I love the red cardinal birds that come to my feeders and are such a delight to see against a white blanket of snow! I like cardinals — we have them all year round in Texas, but I notice them more when the trees are bare. What an awesome release! Counting down til the release tonight! I love deer-especially beautiful reindeer. Fascinated by their antlers. It would have to be deer. We see a lot of them around here. Love the bright red cardinals that draw your eye on a snowy day! Love little Christmas mice, IF they are on a card, NOT in your house. I think of white-tailed deer at Christmastime. I grew up in PA and loved seeing them in the snow, and finding their hoof prints all around the yard. Such a lovely release. And thanks to all the designers for their creative inspiration. I suppose the animal I most associate with Winter is deer. I lived in the Rocky Mountain area growing up and when it was cold and snowy the deer always came down near our house looking for food. It was always kind of magical seeing them. I would have to say it is a tie between the penguin and a reindeer. Both remind me of winter!!!! A Golden Retriever puppy…so cute all cuddled up in those Christmas catalogs! Winter and the holiday season pair up with deer (particularly reindeer) in my world. Awesome release and fabulous creations by the DT! My favorite is deer which reminds me of the serenity and peacefulness of winter. Penguins would be my favorite. I mostly think of deer at Christmas, but the red cardinal is my favourite winter bird. I can’t narrow it down to one… but I can to two! REINDEER – of course…. love the images of them pulling Santa’s sleigh…. and cardinals. I love looking out at fresh fallen snow and seeing a cardinal at the bird feeder. A perfect winter image. Thank you for all the inspiration this month! So cliche but beautiful reindeer is what I think of when I think of the winter season. So majestic in the snow! I guess I’d say a penguin or a polar bear, and of course reindeer! The animals I associate most with winter are the winter fox and the polar bear. I love their winter white coats! Reindeer! They always remind me of the magic of Christmas! funny question. it gets very cold in MN but when I look out and see the squirrels scampering around I know it must be OK. some days when it’s cold and snowy they just burrow in I think and don’t come out all day. Such a beautiful release! Reindeer are the animal that reminds me the winter season and Christmas! My daughter’s beautiful Siberian husky. Yikes!! What a question! I guess I would have to go with polar bear; the cubs are so adorable! And the white fur is perfect for snow. Deer are my favorite winter animal. My favorites are deer and foxes. Cardinals are my favorite by far. When I see them, I feel like one of my family members are near. They are such beautiful birds. Well, I am debating between polar bears and penguins. Guess I’ll go with the penguins, since I know those new penguins will be in my cart this morning. The moose is one of my favorite animals in any season. For the holidays, it’s Merry Christ-moose! Oh my goodness! Every.single.release. You guys are killing me! I love Polar bears. They are so white and majestic! Thanks for all the inspiration! It’s so hard to decide! I love penguins, cardinals and owls. Foxes are super cute too! The deer is my favorite for the holidays!! I love the new October releases can’t wait to shop! Deer say Christmas to me. They can be pulling a sleigh, lighting up a card with a nice red nose, or peacefully looking at the stars in a quiet winter scene but they sweetly, quietly, and beautifully say Merry Christmas in their gentle way. The new stamp is a welcome addition to my Christmas supplies. That baby is so sweet but then the floral sprays at pretty and useful, also. Great job. I have to say cardinals as to see them bring joy and they are like music for the soul in the cold season! Definitely deer! Here in the boonies of northern CA we always have a yard full of them! My favorite would be the polar bear. I love seeing them at the zoo. They are just so cute. Don’t know how they get in that cold water though. Polar Bears. Have always loved how cute they are on holiday cards. This is another great release! Can’t wait to shop. I am a big fan of polar bears, really for any season, but especially for winter. In high school they were our school mascot & still are my favorite today. It’s a toss up between deer (they are so beautiful and stately) and penguins (who are so darn cute and playful). Reindeer and penguins! Thank you for the chance to win! Reindeer! Can’t forget Rudolph and his friends! I don’t have a favorite winter animal, but deer are nice. My heart melts for penguins this time of the year! I love seeing red cardinals against the bland winter backdrop. I love seeing them even more against the white of snow. Polar bears are my favorite, especially the cubs. Great release! My first thought for winter holiday animal is the reindeer! Our town always has reindeer for the kids to see at Christmas time. Love those magnificent animals! The child in me is thinking of Rudolph and maybe even dasher and dancer…..and the rest of Santa’s reindeer! It’s hard to have just one. I love deer, polar bears, penguins, and cardinals! ….polar bears because of the white fur that keeps them warm in the cold. Thank you for the new release inspiration, there are so many “must haves” after seeing all of the Design Team’s beautiful projects! A fat waddling penguin is definitely my favorite winter animal. hmm… a favorite animal that I associate with winter. that’s a hard one, but I guess I would have to say deer. I live in the Desert so I only see winter animals in photos. Love to see pictures of polar bears! I love to see families of deer in the snow. We always have many deer in our area but the added winter snow as a background is so beautiful! As a kid – I would say a reindeer since they drew Santa’s sleigh ! As an adult – I love the lowly donkey in the manger. I’m in love with elephants, so cute and intelligent! The animal I would easily associate with winter is deer but penguins come in a close second. It’s gotta be a deer for me! I’m a Kansas girl, so it’s gotta be the deer for me! Tough question! I think reindeer in general, then bears in our family (because we always say my DH is like a bear), and then doves for me because I like the dove a a symbol for peace in the Christmas season. Reindeer, Rudolph the red nose reindeer always come up first! Reindeer are what popped into my head when I read your question, but my favorite would have to be cardinals. Their beautiful red feathers always lift my spirits on a gloomy winter day. Amazing follow up to last month’s release! The DT did a fabulous job as they made me want everything for this month! Keep up the great work. Cardinals. We don’t have them in my part of the country but going back decades to when my parents would receive Christmas cards in the mail, there were always beautiful cardinals. I associate reindeer with winter. Polar bears are my favorite! I like cardinals and polar bears. Let’s see…when I think of winter and winter weather A penguin comes to mind, but since I do not live in an arctic region I would say the deer. There are lots of them in the wooded area near the subdivision I live in. Beautiful creatures. My favorite animal associated with Christmas has to be reindeer. They are so traditional you can’t have Christmas without them! Reindeer and puppies!! The reindeer pulling Santa’s sleigh is such an iconic Christmas image and dogs because we always seem to have a new puppy in the extended family participating in their first Christmas excitement. Polar bears seem like the perfect winter animal! Though I like penguins too! How do I choose just one? I love all things winter! If I must choose one it would have to be reindeer. I think I’m going to have a very long wish list…I love it all! My favorite holiday critter is definitely the winter deer and the beautiful red cardinals in the snowy trees. it would be a bear. I use them in decorating in the winter and have some cute ones with winter clothing on. I use all colors, black, brown and white. They are fun to tuck in here and there for little surprises. The birds flocking to the feeders. I can spend all day watching them. It’s probably been mentioned already over and over but definitely a deer. The animals I associate with winter would have to be reindeer and penguins. Love this release especially the pot bellies! I would say deer for some reason but now that I’ve seen the cute penguins in this release, that might be it in the future. Love them! Thanks PTI. It used to be deer but with this release, it might now be penguins…so cute.Thanks PTI! I would have to say it is a reindeer. This is another wonderful release. My favorite “winter animal” is penguin. The animal I associate with the winter season is reindeer. I love the splash of color against the snow that cardinals, chickadees and blue jays contribute. It’s just so dramatic and beautiful! I would have to say penguins and polar bears. Both are amazing creatures. What a fabulous release! I love to see red cardinals against the bright white snow in the winter, so pretty! I don´t have a favorite winter animal but i like squirrel. There are not sooo many in Germany . Now in the fall they are hiding their winter feed – very clever animals. This is a tough question as I love penguins as well as reindeer but I am going with the reindeer as they look so elegant and peaceful. They remind me of Christmas which I love!! Why the abominable snowman of course. And reindeer and cardinals. I love reindeer the holiday season. That’s why I love the potbelly reindeer die – super cute! In winter I think of deer and the like– because unlike other fuzzy fat animals– deer I feel need more help against the elements. I love to watch them run thru the forest. The beautiful and graceful deer is the animal I associate with Christmas/Winter. It’s a toss up between penguins and reindeer as my favorite Christmas/winter animals because they make such cute cards! Although polar bears do too, lol. I love the cute and beautiful projects from this release – well done! Favorite winter animal? That’s gotta be reindeer – they pull Santa’s sleigh to bring me presents! Foxes! Saw a gorgeous fox crossing a frozen lake once and it always comes to mind during the winter season! Love the new release! I would have to say deer. I love how cardinals stand out against a snowy, white background! They are so lovely to spot and also are great for all Christmas crafting, too! It’s been a super busy week for me, but I really enjoying seeing so many fabulous projects in your Look Book! So much inspiration here! Cardinals are always a symbol of Winter for me! I love the splash of red against the snow! Reindeer is the first animal that popped into my mind. But then I also thought of a mouse. Lol! I guess due to the “quiet as a mouse” in Twas the Night Before Christmas. I love the Christmas holiday and winter! I am loving so many things in this release, just need to narrow it down to what I really “need”! Lol! I think it’s a tie between reindeer and penguins. They both can be quirky and cute, and they seem to have fun when they play, and they both look great surrounded by snow and ice. Deer are a winter staple for me, living in central PA, surrounded by woods we get to see tons of them throughout the year. Fantastic release! And wonderful, inspiring projects from the design team! Reindeer, if snowmen don’t count. Even though I really love penguins, this year I am into Moose. I don’t even know why. Another fabulous release with samples from an exceptional design team! It’s hard to choose my favorite winter animals. I would have to say deer and cardinals are my top creatures. Living in the upper mid west it would have to be reindeer. Great release this October. I want it all! We have a bird feeder outside our kitchen window. I love watching the Cardinals, Downy Woodpeckers and other birds throughout the winter. I think a Reindeer as they are soo beautiful in the snow! Definitely deer. Maybe it’s because I’m from the Midwest & with winter brings deer hunting season. Definitely polar bears although penguins are a close second. It makes me so sad to know that they are struggling so much due to global warming. It initially came down to reindeer and polar bears, but I think the penguin wins for me. Our bird feeder birds, in the winter they are so colorful. Deer/reindeer are my favorite winter animal for Christmas. Penguins are a close second. Moose, which are easier for us to see in the winter, as they are so dark against the snow. I love deer for cards all year long, but for winter, I love the penguins! I just think they are so fun and cute! A fox. I don’t know why I associate that with winter but I just love foxes! Penguins. Love their waddle! Thanks for a chance to win! Wow! What a difficult question. I guess I would say reindeer since they are so closely associated with Christmas and you don’t see them any other time of year. But if you think of the “winter” season, maybe a penguin or a cardinal. The penguin is so playful in the snow and the cardinal red is just so beautiful against the white snow. Wonderful release. A deer is perfect for a winter scene. Love your potbelly deer! Reindeer of course. But also love a red cardinal. My favorite is the reindeer… brings back a bunch of fun memories from when I was a kid! Cardinals! They bring such a bright pop of color to an otherwise drab and barren winter landscape. Or at least the males do! Starting about this time of the year, nearing winter, I think of the reindeer or deer. We always need to be alert when driving in the country, esp. as deer/deers often come to of the woods and cross the road. Love the images that we can use to put on our winter/holiday cards. My favorite are deer, they are so beautiful and graceful. My favorite winter animal is of course a reindeer! Especially the one with a red nose…..seriously I love reindeer. I would have to say that polar bears are my favorite winter animals. However, we feed the birds all winter and enjoy them very much. I love penguins! Everything goes with black and white, right? Reindeer for sure but I have the cutest picture of one of my cats when he was a kitten climbing up my Christmas tree. It was so funny. I would say, a deer. Definitely reindeer because they pull Santa’s sleigh. My favorite winter animal is a penguin. They look so cute. Penguins are my favorite; they play in the ice & snow year round! I’m looking forward to sending treats in the new chubby penguin!! I always associate deer with the holidays, so yeah.. deer! In the winter, I love to see the cardinals & black capped chickadees at our bird feeders. I also love to see reindeer on the Hallmark Christmas movies Thanks for a most exciting release this month! The polar bear is the animal I most associate with the winter season. Thanks for the chance. It has to be penguins! I just think they are so regal. They always look dressed for a fancy evening in a tux with tails! Yet, they can look so adorable, too! Reindeer to me are the iconic animal in Christmas imagery, they have such an elegant silhouette and I love the delicate tracery of their antlers. I would have to say deer is my favorite animal that I associate with winter. Great release-so many inspiring projects. Mine would be the Polar bear. I think of polar bears, in a scarf and hat of course! Deer! We love our in the country and see more deer in winter than summer and they are so gorgeous! Thanks for all the inspiration! Reindeer and cardinals are what popped in my mind first. I associate deer with winter. Although I must say I am quite jealous of the bears who get to snuggle up and sleep all winter. I would have to say that I associate deer with winter. Reindeer come to mind first when thinking of winter. Thank you for another amazing release! It is hard to choose between polar bears and reindeer. Can’t wait for this release. I think seals are so cute, especially the furry baby ones! I would have to say, Penguin’s. Love to watch them at our local aquarium. The animal that I like best that’s perfect for holiday decorating and crafts is the deer…What’s more beautiful than a stag with a full set of antlers, or a doe with a fawn? There are so many beautiful colors and patterns that look perfect with deer. I love penguins and polar bears both, hard to choose between them. Foxes are nice too and the PTI fox will be joining my stamp collection tonight. I love a cute polar bear with a scarf, etc. Their white fur pops off the page and it also is an easy stamp to use because of the white. Definitely polar bears! Favorite books featuring these animals are among the reasons I’m drawn to all things polar bear. Thanks for so much creative inspiration. I guess it would be penguins. Why the penguins of course. Deer are animals that I think of during the Winter Season, especially when I see their tracks in the snow of our back yard! I love deer. They are so peaceful! This release is just fantastic!! My favorite winter animal is deer, and then fox. Definitely deer! They are such beautiful animals. I think of my fluffy little gold and white mutt in her red and green plaid fleece jacket taking a walk on the beach. For crafting, I love deer, especially reindeer, with bears a close second. There’s no snow in San Diego, but there’s always a flurry of paper snowflakes on my craft table! It must be my daughter’s influence, but the first thing I thought of was 🐧. The pengiun , is the winter animal I most think of…of the reindeer comes next. Yes I know Santa does not count! Although I like winter birds (such as cardinal, chickadees, and juncos), and polar bears can be adorable, my favorite winter animal is the emperor penguin. Sometimes they’re regal, sometimes they’re downright cute, and their antics are fun to watch. I’d have to say a playful polar bear! I love using polar bears as my go to animal for winter themed projects. So easy to dress them up or down, make them silly or formal or just keep them simply themselves. That being said, penguins come in a very close second. PTI,, this release is absolutely outstanding. Cardinals are lovely against snow covered branches. Cartoon type Polar Bears are cute. Penguins. Penguins are one of my favorite animals period. I would say deer remind me of the peaceful winter. They are quiet and they so beautifully dress up a winter or holiday card. I also like cute polar bears and penguins! My favorite is the reindeer. Polar bears! I think of them in winter because they’re white…and Coke used them in their ads. I love ’em! Thanks for another great release! Reindeer because they help Santa!!! What alphabet set was used for the names on the Potbellies? I’d like to personalize them for my grand children. My favorite animal I associate with the winter season is the penguin. They are so adorable! Cardinals! With reindeervin a close second! A deer, as long as they aren’t running into the road in front of us, lol. I love seeing the deer grazing in the fields, especially when there’s a little snow on the ground. So beautiful! It used to be reindeer until a certain movie came out with adorable dancing penguins. Lol. I’d have to say penguins. My husband grew up being called Super Penguin so we have lots of blankets with penguins on them. I’d have to pick penguins. Guess what will be in my cart tonight?! I’d have to say my favorite winter animal is a seal. I used to collect stuffed animal seals when I was younger. Amazing release. I can’t wait for tonight. It’s got to be penguins for me, they’re so adorable I can barely stand it!!! A deer who else could pull Santa’s sleigh. The deer stamp set is so cute. My favorite winter animal is the deer. I think it is just that they are associated with Santa and Christmas but they are also adorable on cards. Reindeer! It’s cliche but, I have the most beautiful set of cotton batting reindeer that I love with all my heart! There are so many beautiful animals that I associate with the winter season. The one I would pick as my favorite would have to be deer. So graceful and lovely. The animal that I associate with winter is a deer. After all a lot of people use them to decorate with at Christmas. Thanks for the chance to win. Penguins. So adorable and cute! Buffalo with all the snow, I think of deer. During the holidays I think of a red bird. I think of them all year long but I especially love to use cardinals in my paper crafting during the holidays. I associate polar bears and penguins with winter time, and typically use them on my winter cards. Congrats on another awesome release! I would say deer, I love to see them at our cabin in the winter time! I also like to create my Christmas cards with a deer in the woods scene, thanks to Betsy and her awesome Christmas kits! During the winter I enjoy watching the cardinals at the bird feeder. The reindeer. Hard not to love Santa’s little helper. My favorite animal associated with the winter season is the Penguin! I would have to say reindeer. Your October release is amazing! Can’t wait to shop tonight! The animal I most associate with Christmas and the winter holidays is the reindeer! I remember, during my childhood, waiting to hear the reindeer prancing and pawing on our roof, shaking their jingle bells! A beautiful red cardinal in a green pine tree with snow on the boughs says Christmas to me. Hmm, I do love reindeer! But polar bears are darling too! We live next to a huge wetland area near the east coast of Florida and it is the destination for hundreds of migrating sandhill cranes and wild ducks. They fill the air with the sounds of their wings and their calls to each other. It is simply magnificent! I think I would have to say reindeer!! My favorite Christmas season animal is a reindeer. My favorite winter animal is a polar bear. What a fun question! I would normally say polar bears but then Betsy went and made the cutest penguin stamps, so I might be changing my mind. My favorite winter animal would be chubby polar bears. They always look cheerful to me. Polar bears totally remind me of winter!!! I love polar bears and always think of them during the winter season! Favorite animal for winter would be the Penguin. Just Love the Penguins this release!! Reindeer of course because otherwise Santa could not arrive! Polar Bears and Penguins are my favorite holiday animals! I just love them! Rudolph the Reindeer, a favorite from childhood! Hmmm…favorite winter animal…deer are always pretty in winter landscapes. But I’m seriously annoyed by any and all deer because of what they did to my garden this year! So I’d have to answer that bright red cardinals are my favorite winter animal. They are so gorgeous against fresh white snow. Thanks for the chance to win a gift certificate! Cardinals always make me think of winter. I was blessed to grow up in Ohio where they decorate the winter landscape. I like cardinals! I love the red contrast with white snow. As the torrential downpour surrounds me, I hope I can make an order. Not only that but my satellite internet is down. Needless to say, I’m still making my list and hope there is enough of what I want tomorrow when I get on a reliable internet at work. So many things to love and create. thankful for my mini I pad and AT&T and phoned. Challenging. I always think of cardinals for the winter season. The vibrant red is beautiful, reminding me of Christmas. I love the deer-they are so graceful! And I like them in winter since I don’t have any plants left for them to munch on!! My favorite winter animal would be a deer. It makes me think of Christmas. Cardinals. I love how they look against a snowy backdrop. Penguins, so love the new stamp set! My favor animal for the holiday season is a fawn. I love the doe eyes and the velvet antlers. I would have to say penguins are the animal I most associate winter with…LOVE your company & this a great release!! It’s definitely the reindeer…especially Rudolph! We love to make an extra special for them on Christmas Eve, too! Well I think they’re all season, but for winter, definitely penguins! Growing up in the Adirondacks we are surrounded by the beauty of deer! They are sweet, playful and majestic to watch! Deer is the animal that I think of the most at winter 🙂 Creative release! Deer…probably because of a certain special one named Rudolf! Reindeer for sure!! Love the new reindeer die and bubble bellies!! !